Heard from three of my amigos, today. First, my buddy Less (aka: Rasta) IMed me from Amsterdam, of all places. He was on a train and we swapped messages about the weather and his trip. He sent me a snap from his adventures in Dublin, Ireland. 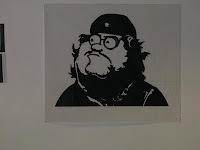 Unless I'm way off base, I think it is supposed to be Peter painted as Che Guevara. I want this tattoo'ed on my buttocks. Next, I talked to Adam (aka: Icetre) about Pinball and Penn Jillette's new web-based shizzle, "Penn Says. "Every time I'm in Las Vegas, I debate going to see Penn & Teller. If it wouldn't put such a dent in my wallet, I'd see them every time I stopped through their neck of the woods. But these days a hunded dollar ticket is a hundred dollars less I have to spend on the kids or student loans. Also said goodbye to a buddy/coworker, in Las Vegas. Kevin (aka Kevin!) is moving to the San Jose area with his spouse. He was a great resource to have available at work and we talked a great deal about our private trials and tribulations. I'll miss him, but hopefully he'll pop up on AIM every now and then to let me know how his adventures are going. Finally, talked to Kim (aka: Alpha Dawg) about unemployment and the fact that he's going to be a Grand Pappy this year. I suggested he give his lady (Nenna) a baby. Then his second child and his first grandchild would be the same age. He said I had a knack for F'ing up his good moods.